Tucson, the "City of Sunshine" and metropolis of southeastern Arizona, lies in the wide valley of the Santa River, flanked by high hills. The warm, dry climate has long attracted tourists and people seeking an escape from winter in the northern regions. The city has many cultural and natural attractions to keep visitors busy. This is also a good city from which to explore some of the nearby smaller towns. Popular outings from Tucson include a visit to the historic Western town of Tombstone and, further afield, the mining town of Bisbee. Both of these are located southeast of the city. Directly south of Tucson is the little community of Tubac, an artists colony with interesting shops offering art and trinkets. The Arizona-Sonora Desert Museum offers an close up and detailed look at the desert landscape. This museum is a zoo, natural history museum, and botanical garden all in one. Displays of living animals and plants native to the Sonoran Desert are featured, including some endangered species such as the Mexican wolf, thick-billed parrot, ocelot, margay, jaguarundi, desert pupfish, Sonora chub, bonytail chub, razorback sucker, and Gila topminnow. There are over 40,000 plants representing 1,200 species as well as a gem, mineral, and fossil collection. One of the highlights is the bird show, with hawks flying over the audience. Afterwards, information on the birds is provided, and an opportunity to see them close up. This mission station in the southwest of Tucson was established by Spanish Jesuits in 1770. The mission buildings of San Xavier del Bac, in particular the richly furnished church, are fine examples of the Baroque architecture of the colonial period. Also known as the "White Dove of the Desert", it is still used by the Tohono O'odham Indians as a spiritual center. Visitors can walk through the old church. The museum contains artifacts highlighting the history of the Mission. Saguaro National Park, part of the Sonoran Desert, extends east and west of Tucson. The characteristic feature of this desert area, the lowest in North America, is the abundant and varied flora and fauna which flourish in spite of the great heat. Visitors can see the typical saguaro or candelabra cactuses, which are the tallest species in North America, as well as birds like the Gila woodpecker and cactus wren which live on the cactuses, rattlesnakes, desert tortoises and the Gila monster (a large lizard). There are numerous hiking trails of different lengths. Tucson Mountain Park is home to Old Tucson Movie Studios and the Arizona-Sonora Desert Museum. The park covers about 20,000 acres of Sonoran Desert landscape, just west of Tucson. There is an extensive trail system for hiking, biking, and horseback riding, although many people come here simply to use the picnic areas and enjoy the sunsets. This is a day use park with picnic areas. Mountain lions and bobcats, along with a host of other wildlife, live in the park, although some of these tend to frequent the most remote areas. The little make-believe Western town of Old Tucson, in the style of the late 19th century, was reconstructed in 1940 as the setting for numerous Western films. It is located out on its own in the desert, with surrounding hills. These sets have been used for decades, with movies like Young Guns, and many films starring John Wayne, being shot here. There is a concert series and dance hall revue, along with other forms of live entertainment. Wild shoot-ups are re-enacted by actors. Visitors can take a guided tour to see which sets were used in various films and learn about the history. You can also wander through the "town" on your own or have lunch. Attractions for kids include a mini-train, antique cars, panning for gold, and trail rides. History upon history resides in the El Presidio Historic District, one of the oldest inhabited sites in the USA. Although this area was once inhabited by the Hohokam Indians, what visitors see today is a mix of Spanish-Mexican and Anglo-American architecture, along with beautifully restored adobe houses. 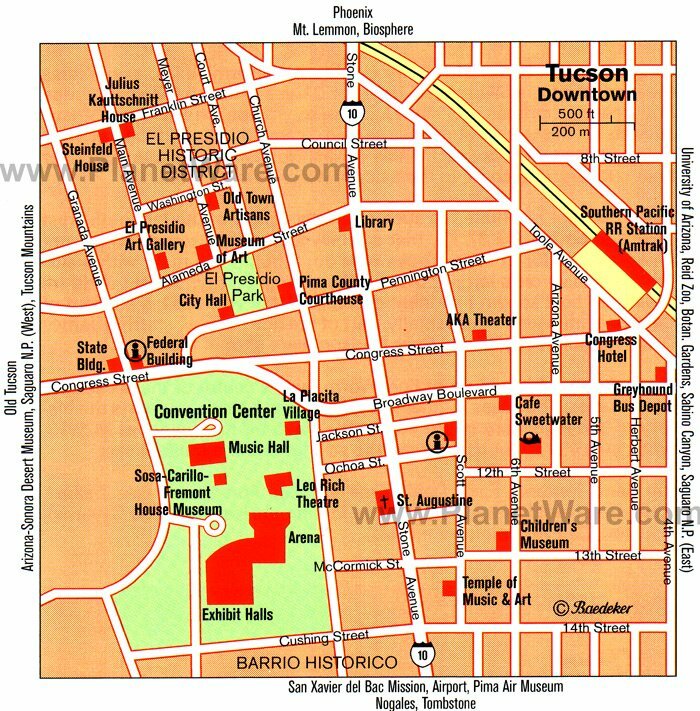 One of the main tourist draws in this area is the Old Town Artisans, a restored 1850s marketplace in downtown Tucson. It includes an entire city block of galleries, stores, and a restaurant, all set in unique buildings. The stores offer selections of art, jewelry, crafts, home decor, and other items by artists from Tucson and around the state. Some of the items on offer include pottery, paintings, metalwork, photography, Native American wool rugs, and carvings, among others. The restaurant offers el fresco dining, or indoor seating in a converted 1920's gasoline station. Visitors come here as much for the shopping as they do for the atmosphere. The Pima Air and Space Museum is the largest privately funded air museum in the world, with more than 300 aircraft as well as spacecraft. The collection includes historical aircraft as well as some of the most advanced models. Featured attractions include John F Kennedy's presidential plane and a replica of a 1903 Wright Brothers Flyer. For an additional fee visitors can take a bus tour to the adjacent "Boneyard", the 309th Aerospace Maintenance and Regeneration Center. The University of Arizona in Tucson is home to the impressive Arizona State Museum, Mineral Museum, Center for Creative Photography, University of Arizona Museum of Art, and the Flandrau Science Center. Visitors can spend a couple of hours or a couple of days seeing the sights on this campus. With its large archeological collection the Arizona State Museum documents 10,000 years of Indian cultural history. Established in 1893, it is the oldest and largest anthropology museum in the Southwest of the United States. Exhibits include the largest vessel collection of Southwest Indian pottery, a comprehensive Hohokam artifact display, one of the top Navajo textile collections, and hundreds of Mexican folk masks. While the Arizona State Museum is the main attraction on the campus, those with more time or other interests will want to check out some of the other facilities. The Mineral Museum, with a vast collection of gems, minerals, and meteorites from the USA and around the world, has a distinct focus on minerals from Arizona and Mexico. The Center for Creative Photography, created in 1975 by the one-time University of Arizona President John P. Schaefer and renowned photographer Ansel Adams, features tens of thousands of photos and focuses on the history of North American photography. The University of Arizona Museum of Art in Tucson, also worth a visit, features a large collection of works, from old masters through to contemporary art. The St Augustine Cathedral was designed in Mexican Baroque architectural style. Built in 1896, the cast stone facade was completed in 1928 and is similar to the Cathedral of Queretaro in Mexico. The facade and towers are all that remain of the original structure after the cathedral was rebuilt in the late 1960s. Catalina State Park, north of Tucson, is a desert region with picnic areas, and hiking and horseback riding trails. Visitors also come to the park to enjoy camping, plant and wildlife viewing, and to see the Romero Ruin archeological site. These are the remains of a Hohokam Indian village that was occupied between AD 500 and AD 1450. The site also contains rooms of mud and rock borrowed from the abandoned Hohokam village. These structures were built by rancher Francisco Romero late in the 19th C.
The Reid Park Zoo is a relatively small zoo with a surprisingly good collection of exotic animals. It houses such favorites as elephants, polar bears, lions, and many others. The facility is spread out on 17 acres with nature exhibits. One of the interactive experiences available at the zoo is the Giraffe Encounters, where for a small fee you can hand feed a giraffe. There is also the Reid Park Zoo Express train, a wet play area, and changing daily activities. The International Wildlife Museum in Tucson features temporary exhibits focusing on wildlife from all over the world. Preserved specimens and dioramas allow visitors a close up look at animals and their natural settings. The museum offers a chance to learn about animal behavior, habitat, and much more. Luxury Hotels: The Loew's Ventana Canyon Resort, voted as one of the top 50 hotels in the world for family travel by Travel + Leisure magazine, is nestled up against the Catalina Mountains and features multiple pools and two golf courses. Another top resort in the same area is the Westin Paloma Resort and Spa, with five pools, three hot tubs, a 177-foot waterslide, a 27-hole Jack Nicklaus golf course, and nine restaurants. Closer to downtown, the iconic Arizona Inn, built in 1930, offers a convenient location, along with luxury and privacy. Mid-Range Hotels: With a great location in the heart of downtown, near the El Presidio Historic District, is the Best Western Royal Sun Inn & Suites. For a unique, experienced-based stay in the desert, try the White Stallion Ranch. This dude ranch, outside the city limits, features lovely western-themed rooms and comes complete with your own horse during your stay. Just a short drive from downtown and easily accessible off Interstate 10 is the Country Inn & Suites, offering complimentary breakfast. All of these properties have outdoor pools. Budget Hotels: For an eclectic downtown experience at a reasonable rate, the Clifton Hotel makes the grade. This restored 1940s-era building, in an unbeatable location, offers rooms decorated in unique styles. Another historic hotel, dating from 1919 and oozing hipster style, is the fully renovated Hotel Congress. If you prefer something a little more mainstream La Quinta Inn & Suites is located close to downtown near Reid Park and the zoo. Families will enjoy this museum. The hands-on, interactive exhibits include a variety of topics, from the arts and sciences to nature and construction. The Tucson Children's Museum is housed in a 1901 building designed by architect Henry Trost. The Colossal Cave in Vail, located east of Tucson on Highway 10, is one of the largest dry caverns in the United States. Parts of it have yet to be explored. Local legend has it that the loot from an old stagecoach robbery is still buried somewhere inside. The park also features a museum, butterfly garden, stagecoach rides as well as hiking and horse trails.